Photo The North American Fly Fishing Forum. In the five years since Maxine began fly casting — which she describes as “fly fishing without the fish” — she has become the sport’s youngest champion. And this past weekend, at 14, she defended her accuracy title at the world championships in England with a score of 52 in the women’s division — 21 points clear of the second-place finisher. She also won the salmon distance category. “I never knew I would become this good at anything,” Maxine said in a recent interview. Maxine’s speedy journey to casting supremacy began when her father, Glenn McCormick, took her to the Golden Gate Angling & Casting Club in San Francisco in 2013. Like most people who come to the club’s pools, he simply wanted to become a better fisherman. The McCormicks moved to Portland, Ore., after the 2016 world championships, and Maxine occasionally practices with Rajeff, who lives in Washington State. Casting has traditionally been a male-dominated sport, but Maxine is part of a long history of female fly-casting champions, including Joan Wulff and Pamela Peters. “Just ’cause of the title, of being world champion,” she said. 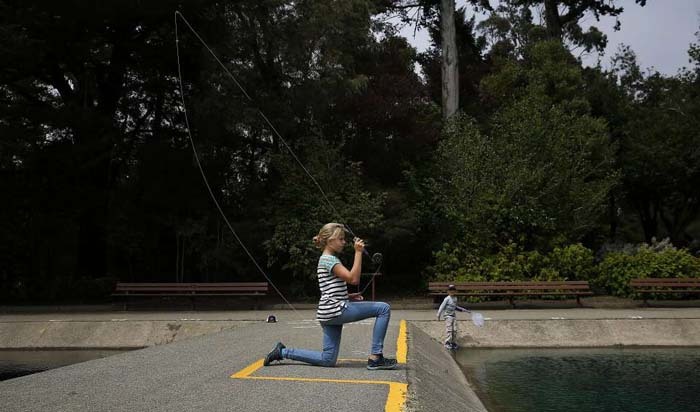 During a recent training session with Kris Korich, her coach at the Oakland Casting Club, Maxine worked on her distance-casting technique: She stood with her left foot in front of her dominant, right foot as she arced the long, flexible rod above her head. There are times when she doesn’t feel like casting, when she wishes she were hanging out with friends, or maybe watching a movie. It’s hard being the only young person in a sea of baby boomer men. At this year’s national championships in Indiana, she and her little brother, 7-year-old Tobias, who is also a burgeoning caster, were the only kids around. Maxine is not sure what the future holds. There is no clear path for fly casting superstars the way there is for other sports. She loved being a counselor in training at fly fishing camp this summer. She might teach more. But first, there was a world championship to take care of. She was mainly focused on beating her own scores, she said — and of course, those of her father, her coach and Rajeff. Read New York Times story . . .
Read San Francisco Chronicle story . . .